Music Row was the locale for a huge news conference announcing a major change for the iconic Alan LeQuire sculpture “Musica” with Forest Home Media partner and Fountains of Musica Foundation board member, Nancy McNulty, coordinating. In the Nashville announcement, all major media outlets were represented. More about the privately funded initiative below or visit Fountains Of Musica. Nashville’s iconic Music Row sculpture, “Musica,” will be undergoing a major transformative addition with a series of choreographed fountains, effectively completing the work of acclaimed artist Alan LeQuire, announced in a February news conference by the nonprofit behind the project, The Fountains of Musica Foundation, in partnership with Nashville Mayor Megan Barry and Music Row representatives. Overview of the Fountains of Musica Foundation news conference announcement produced by Andrew Rozario, Steven Knapp and Mike Stryker. Barry agreed stressing the landmark is a critical component of Music Row and will make it an even more popular tourist attraction. 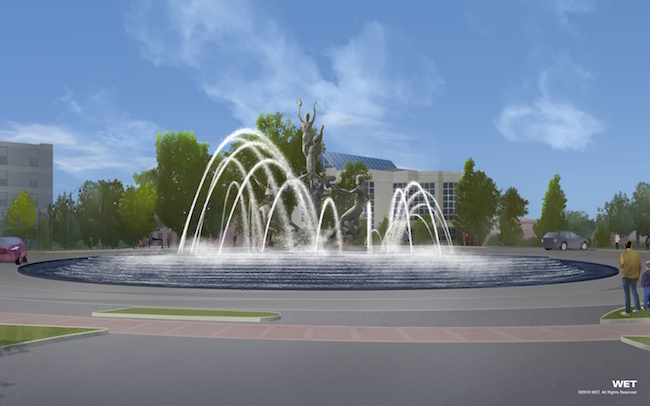 The announcement of the fountains also kicks off fundraising efforts which board president, Andrée LeQuire, said will be an 18-month project. Fountains, designed by WET, will be transforming the Music Row sculpture, “Musica.” Rendering, by WET. The sculpture is 38 feet in height and composed of nine dancing figures in a circular composition capturing the joy and exuberance of all the diverse and artistic genres of Music City. Industry leaders with an impressive international list of accomplishments, WET was chosen through a formal request for proposal process by the foundation to complete “Musica” by integrating its trademark fountain creations into the sculpture to achieve the board’s vision for this landmark destination. The fountains will be comprised of a series of water-clad terraces that encircle the central sculpture and create a grade change within the site. The outermost terrace is divided into steps facing Demonbreun Street, from which flows a frothy cascade of water that connects it both symbolically and physically with its human audience. A spiraling formation of pulsing jets emerges from the terraces and radiates around the nine bronze dancers. Water glides through the air toward the outer reaches of the traffic circle, as if the muses themselves are showering their artistic spirit across Music Row to the citizens and visitors of Nashville. In addition to the central fountains around “Musica,” Child said there will be an interactive water feature in Owen Bradley Park for kids as well as a complementary fountain built into the median divider cascading down Division toward 17th. Child said once funding is secured, the sculpture transformation would be completed in the fourth quarter of 2017 and unveiled in a community celebration. For more information, visit FountainsOfMusica.